CHICAGO — James Shields won for the first time since opening day, Yoan Moncada and Yolmer Sanchez homered to lead off a three-run first, and the Chicago White Sox beat the Cleveland Indians 5-1 on Tuesday night. Moncada and Sanchez connected on consecutive pitches from Adam Plutko. Matt Davidson drove RBI doubles off the center-field wall in both the first and a two-run fifth, and the White Sox beat the AL Central leaders after losing their first four meetings this season. 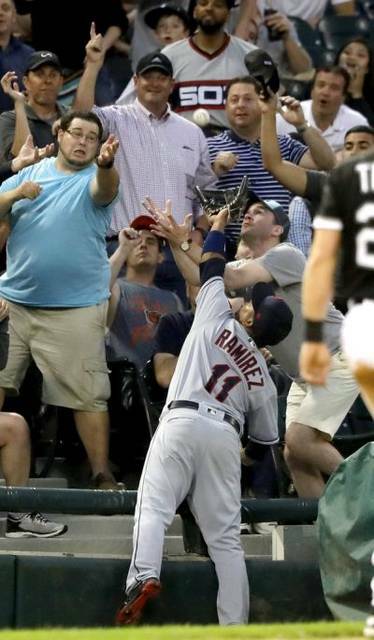 The Indians got a sacrifice fly from Jose Ramirez in the sixth and had runners on first and third with one out in the ninth, but came up short after winning five of six. Xavier Cedeno struck out Jason Kipnis before Joakim Soria retired Yan Gomes on a fly to the center-field warning track for his ninth save in 11 chances. Indians: 2B Jason Kipnis (neck) was back in the lineup after sitting out the previous two games and so was 1B Edwin Encarnacion (ankle) after missing three in a row. … The Indians continue to hold off on activating OF Brandon Guyer (strained neck) after he was hit in the wrist by a pitch during a rehab game for Columbus on Sunday. Manager Terry Francona indicated they might wait until Thursday, when the White Sox send a lefty to the mound in Carlos Rodon. “We’re just trying to make sure he’s ready,” Francona said.